A selection of pictures of Kota Belud, a small town in northern Sabah, about 60 Km north of Kota Kinabalu. 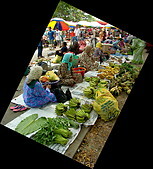 Kota Belud is famous for its Sunday market, when people from all over Sabah meet to trade goods (mostly agricultural products). Most of the Kota Belud photos shown here were taken on a visit to the Sunday market. On page two you'll find a few images of downtown Kota Belud.